Sometimes having to buy a product from a well-known brand should be sufficient to know that you are getting the right product. The same happens when you opt for the La Crosse weather stations. 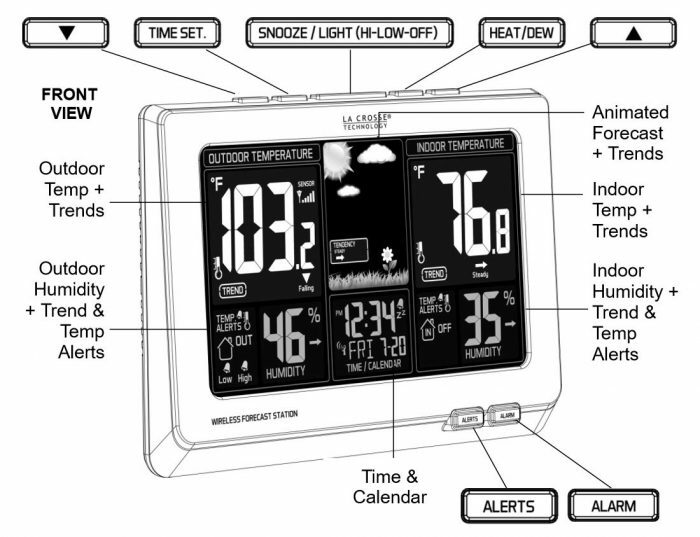 They would give you that impressive build and multiple features that you always need in the weather stations. ​The focus today is the La Crosse Technology 308-1414W model. It comes with a number of features that might seem similar with other models, but it is a bit advanced to give it an edge over the other models. 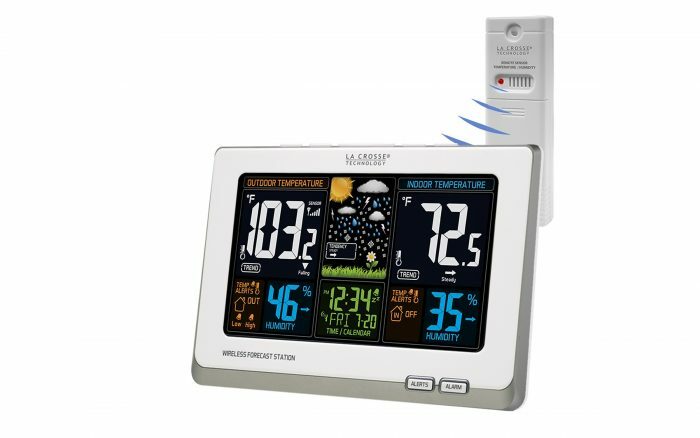 The next time you are on the market for a cheap and still functional weather station, it is important that you consider this model. The weather station is designed to measure the temperature and relative humidity. This means that you get instruments such as the thermometer and relative humidity sensor. It should be able to measure the different indoor and outdoor temperatures and relative humidity so that you can understand more about your surroundings. ​For the temperature, it can measure from +33 degree Fahrenheit to +122 degree Fahrenheit for the indoor temperature while for the outdoor temperature, it can measure from -20 degree Fahrenheit to 140 degree Fahrenheit. As for the humidity range, you will get from 19 to 97 percent. ​It is important that you get to install the sensors correctly or else you might end up not receiving the correct data. The sensors are designed to keep updating the sensor information on your display within every 30 seconds. Such an amount of time should be enough to deliver on your need to know more about the changes in the weather condition. Most people would love the model since it has an impressive outdoor or indoor transmission capability. The model relies on wireless transmission to communicate with the different sensors that have to send data to the display console. The manufacturer has given it a rating of transmission range of 300 feet. Such an amount of transmission should be enough for a person who needs to use a personal weather station for home use. It is however recommended that you keep the sensor and display within 200 feet if you want to enjoy flawless results all the time. Comparing it to some of the other common La Crosse models, this weather station seems to have a bigger screen. The display is also a bit different in a way that makes it even more enhanced than before. 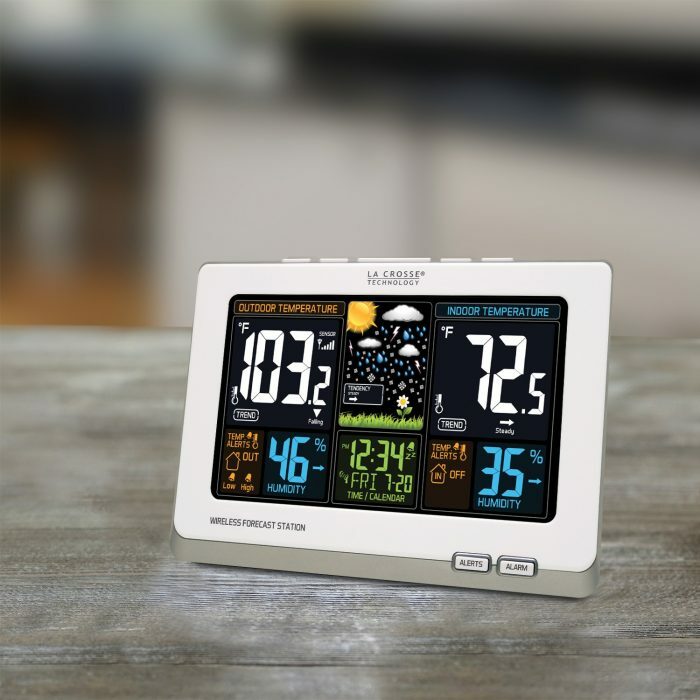 The display is made to be bigger so that you have an easy time checking out the different weather station data with ease. The display is oriented to be landscape rather than portrait. This means that you have a larger field of view ensuring that you get to enjoy checking out the different weather conditions with ease. It is possible that you will feel that the display is better than the other models you have used before. It is not just about the outer looks, but also how the data is arranged that also matters. On your left, you will see the outdoor temperature with its corresponding humidity. It is the same thing for the right side where you get to see the indoor temperature and corresponding humidity too. ​The middle part of the display console displays the animations that show you the weather. It can be sunny, cloudy, partly sunny, rainy, snowy or stormy. It also displays the time, alerts, and the day still in the middle part. ​On overall, it is easy to read the different data sets displayed on the screen and also understand it. There are no complex symbols that would get you confused. The weather station uses AC power as the primary method of powering the console. The manufacturer will supply you with a 5-volt AC 0.6A power adapter. It should be able to work with various 120V electrical outlets. The manufacturer recommends that you get to use the 120V outlets only if you want the model to work effectively. The weather station uses 3-AAA, LR3 or IEC batteries as the backup power just in case there is a power blackout and you still have to receive the data from the sensors outdoors. The battery life of such batteries can be up to 36 months, so long as you use the AC adapter as the primary power source for the station. ​The outdoor sensor uses 2-AA or LR6 batteries. You can notice that they are different from what you would have used for the display console. They would last relatively at a lesser time since they are the primary power source for the sensors. The battery life is about 12 months and you have to replace them. Just like any other product, it has to be well taken care of and still maintained to make sure it keeps on working great for a long time. Below are a few important tips you can follow to ensure you get to keep the weather station working correctly. You are not to mix the old and new batteries. In case you have to make replacements, replace the whole bunch. It is important to maintain the same brand of batteries. You are not to mix the alkaline and standard batteries. The weather station would have sensitive parts, so you do not want to expose it to extreme cases of shock, vibration and temperatures. If you have to clean the station, use a soft damp cloth. There is no need to use solvents or the scouring agents that might prove to be quite damaging to the model. Do not keep the station in places it might be exposed to dust conditions. Having too much dust does not always work great for the electronics. The improper use or opening without authorization could lead to voiding the warranty. It is better to get a professional repair it if there is a problem. The manufacturer offers a 1-year limited warranty on the product. The warranty is on the manufacturing defects of the workmanship and materials. Keep in mind that the warranty period starts from the date you purchase. It is also only valid for the products purchased and still used in North America. You should also be the original purchaser of the product. ​The manufacturer recommends that you contact the company if you want to receive the warranty. You would be advised where to take the product so that it can be assessed for the delivery of the warranty service. You may have to take the product with your original dated bill of sale. It is used as proof that you are the original purchase of the product. It comes with a wireless transmission indicator. You can always put the console where the transmission is the strongest. There is the possibility of setting the alarms. You will get notified when the temperature hits that desired mark. The animated forecast icons are great for easy understanding of the weather conditions. It can be great if you have to teach your kids about weather. If you are on a budget, then it should not be an issue when opting to buy this model. The price is quite affordable for many people. You will get to have your own weather station in the house thus having a great time knowing more about the weather conditions. ​It is true that it may lack a few things here and there, but on overall, it is still a great model with many features you could use. It can be best described as a novice weather station for those looking to upgrade later if they need more weather conditions assessed.